Years ago, I used to run with my boss, Ed. He would pop his head in my office around lunch time, and we’d brave the streets of Stamford, CT, at a brisk pace, talking about work and family when we weren’t huffing and puffing up a hill. One year our team had a huge project in Chicago. In the winter. When the temperatures on Lake Michigan were single digits. And the hawk (aka the wind) was out. Geez. Knowing that Ed would be waiting in the lobby of the hotel at 6 a.m. was all the motivation I needed to lace up my running shoes and put on gloves. I was not going to disappoint the boss. 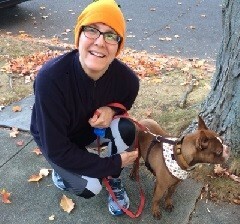 Earlier this month I started running with Cooper. He seems to know the difference between my running shoes and my cross-trainers, which I wear when I join my DVD buddies Shaun T and Tony Horton for indoor workouts. Cooper wiggles his tail-less body in anticipation when he realizes a run is in his future. And although I don’t have the need to impress him the way I did Ed, his enthusiasm is enough to get me over the “should I go for a run?” hump. Meanwhile, my friends Dede and Kiye have made the difference recently between my thinking about running a 5k and actually completing one. And as I look ahead to a NJ business trip this week, I know I can count on my colleague Lester to slow down enough to join me in a before-dark after-work run on a section of Princeton NJ’s beautiful towpath. My email exchange with Lester went something like this: “Hey, I’ll be in the office Monday afternoon after the Philly meeting. Don’t know if I’ll stay over or not.” He replied, “I’ll bring my running stuff just in case.” Easy enough. If work hijacks the day, no harm no foul. But I’m hoping things aren’t too crazy so I can spend time with a colleague I don’t get to talk to a lot. Doing an activity we both enjoy. So what do you like to do? Hike? Walk? Zumba? Cycle? What are you waiting for? Invite someone to join you. And although I like the accountability of making a date to exercise, I do appreciate the social aspect. Sometimes, it’s nice not to go solo. Share the experience. Your heart will benefit from cardio and your “heart” will benefit from connection. Check out my page on Team BeachBody to purchase Insanity, p90x, Shakeology and other BeachBody products.